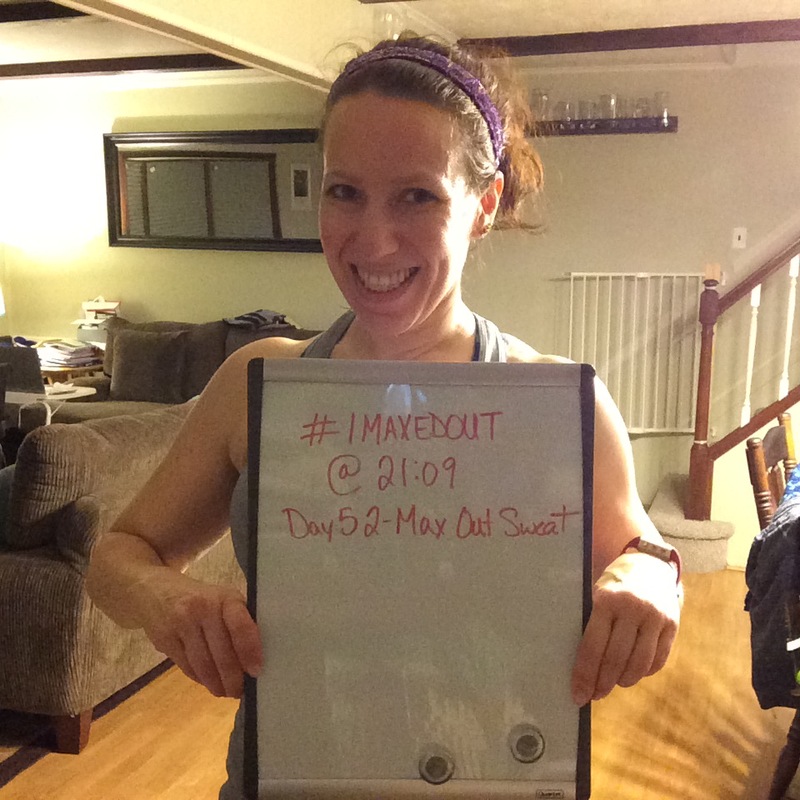 I’ll throw in my week 8 max outs, but here are the final Insanity Max 30 results! I am down .8lbs and 2.75″…my weight was up and down with the holidays and some other rough patches, but I’m pretty happy with the results! I see differences in how my clothes are fitting, have been wearing some of my pre-pregnancy “skinny” clothes and I FEEL different! I don’t think I’ve ever been so proud to finish a program. 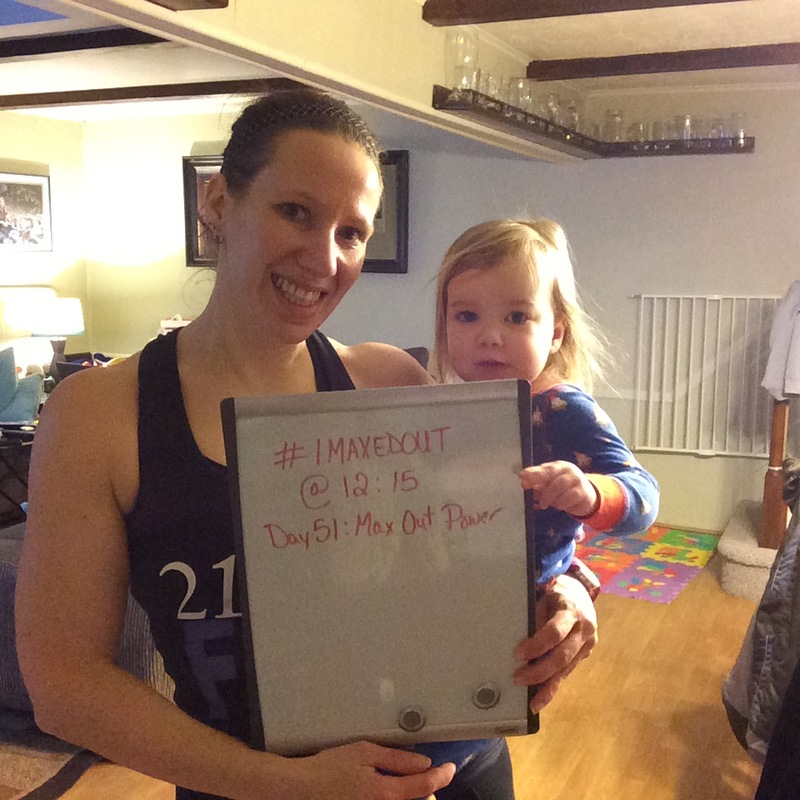 This was such a challenge for me mentally…pushing myself to max out further along each week, dealing with needing to modify, truly difficult workouts each weekday super early in the morning! I think that putting it all out there for others to see was the ultimate motivation and accountability. So thank you for that!! Physically, it was super challenging as well, which was helped by only being 30 minutes a workout. 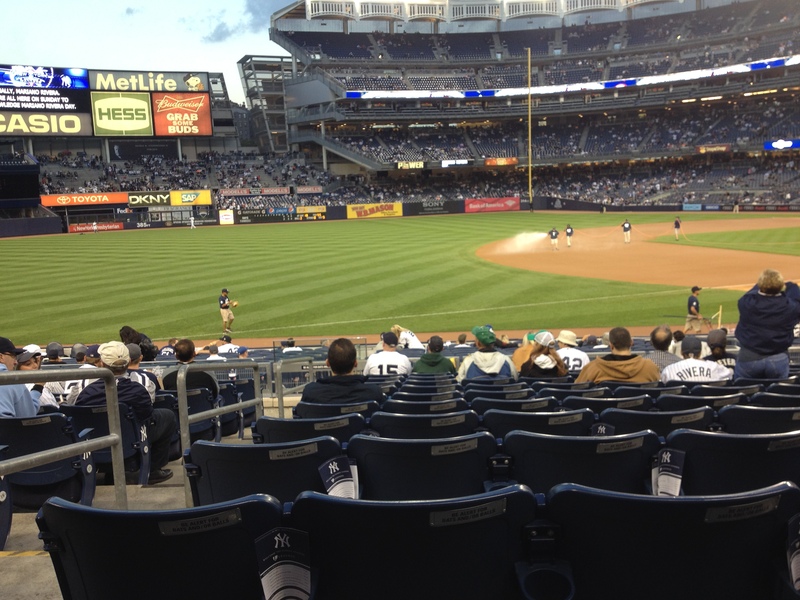 Also, there is a lot of variety in those 30 minutes…every move changes in 20-60 seconds. So you try to hold out maxing out during each move! 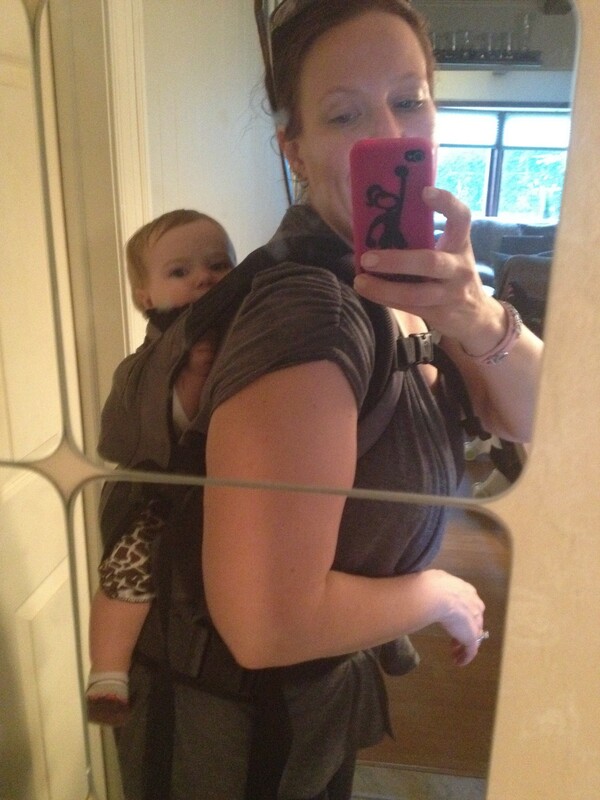 Something I’m not sure I have done before is not miss a workout on the planned day…but I did it with this! I didn’t push off any of the workouts…I think that’s just me craving routine. And that’s what happens when you plan for your workouts to be before anything gets in the way. that the people in the video max out…this is kind of good and bad. You see them going and think “I could just max out too”, but then at the end they all tell you their max out times. And sometimes, you beat them! Others, you think “I can do that!” and let it motivate you more. The workouts are exhilarating. For serious! I felt amazing at the end of each of them. So here are my max outs from the final week…read till the end for my final “fit test” – redoing the Cardio Challenge workout that is the first workout of each month 1 week. 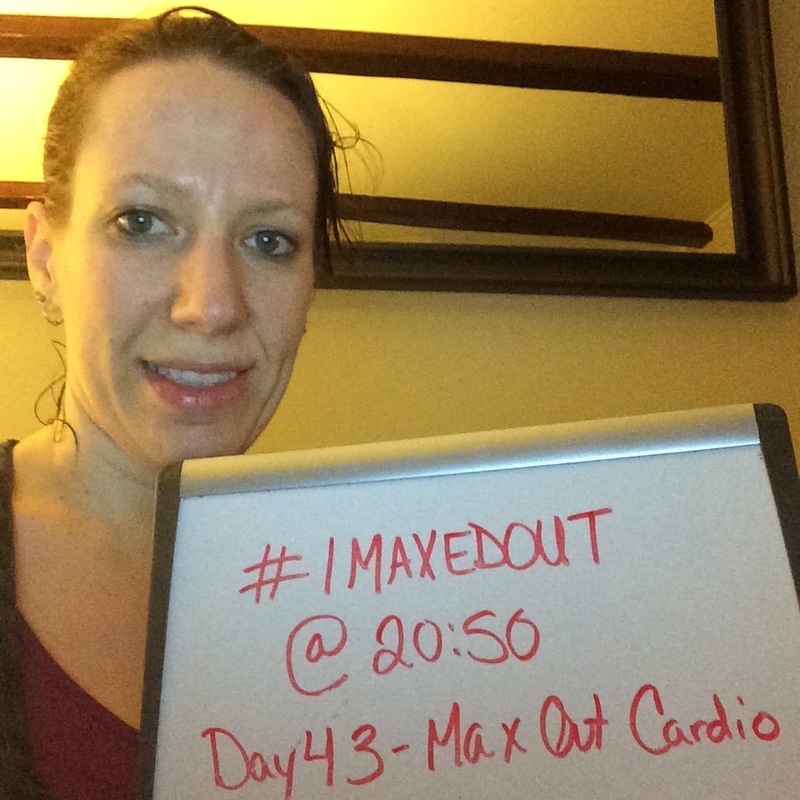 Day 50 – First time I didn’t max out! I made it through the whole 30 minutes! 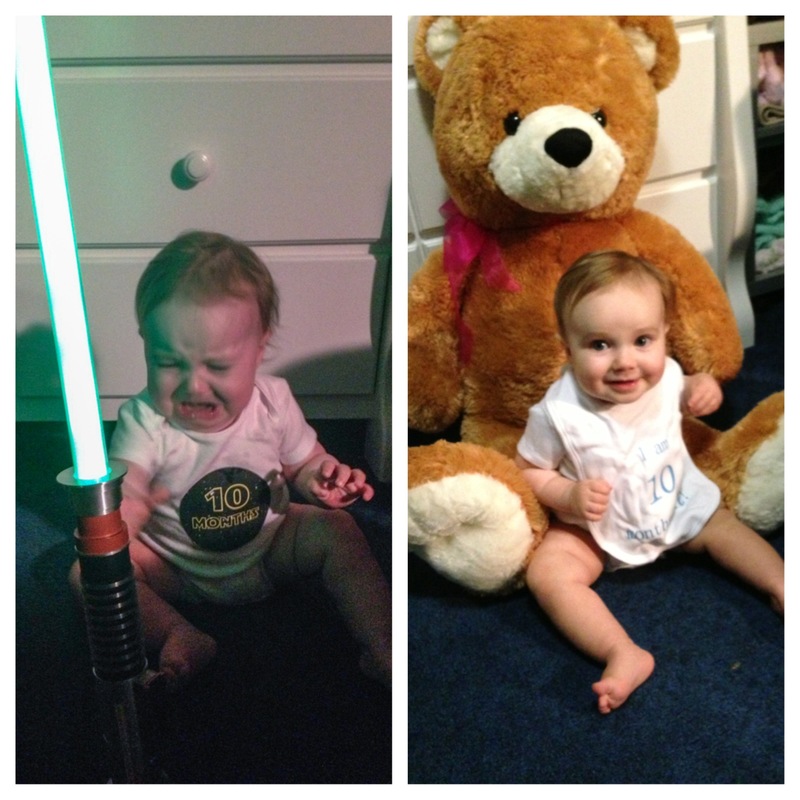 Day 51 – my daughter woke up before I had the chance to take a picture, so I brought her in. It probably would have been funnier to have her take the picture! But then you wouldn’t know when I maxed out. 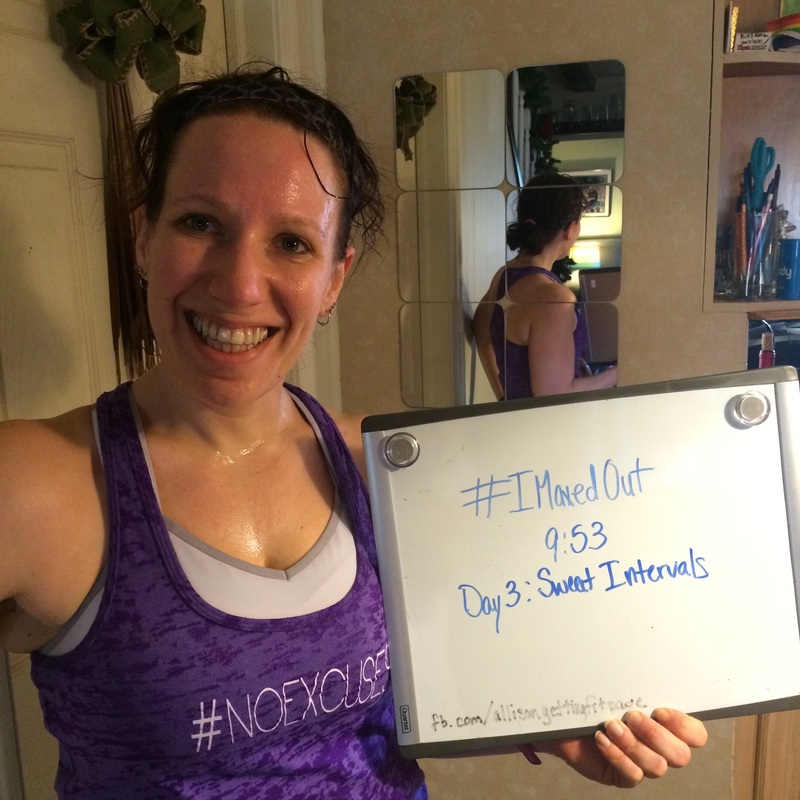 Day 52 – very sweaty! 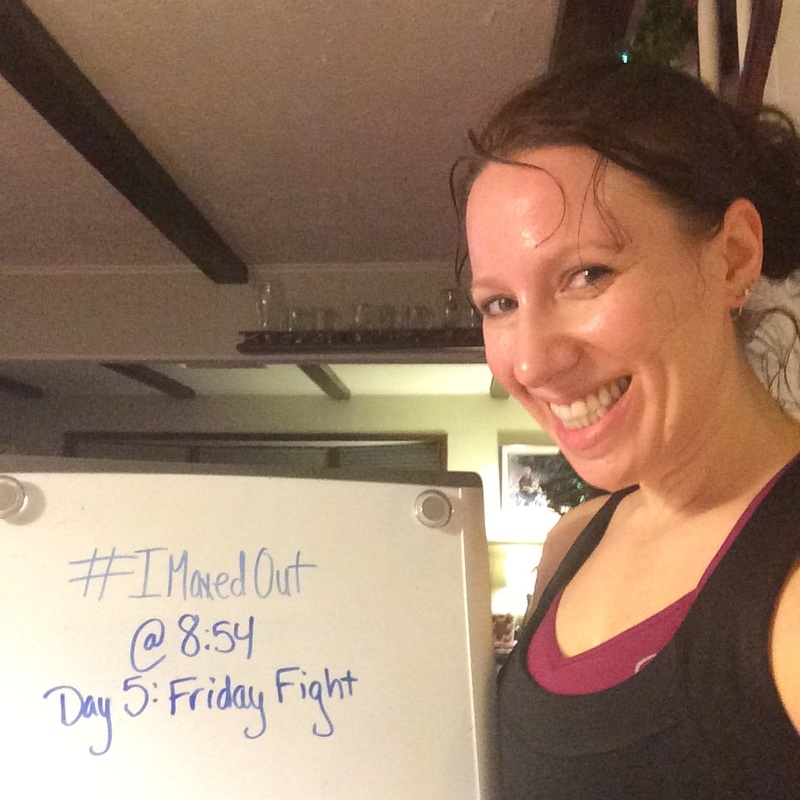 Day 54 – The Friday Fights were such a challenge – one minute for most moves and the first planned water break is around 15 minutes in! Day 55! Today! 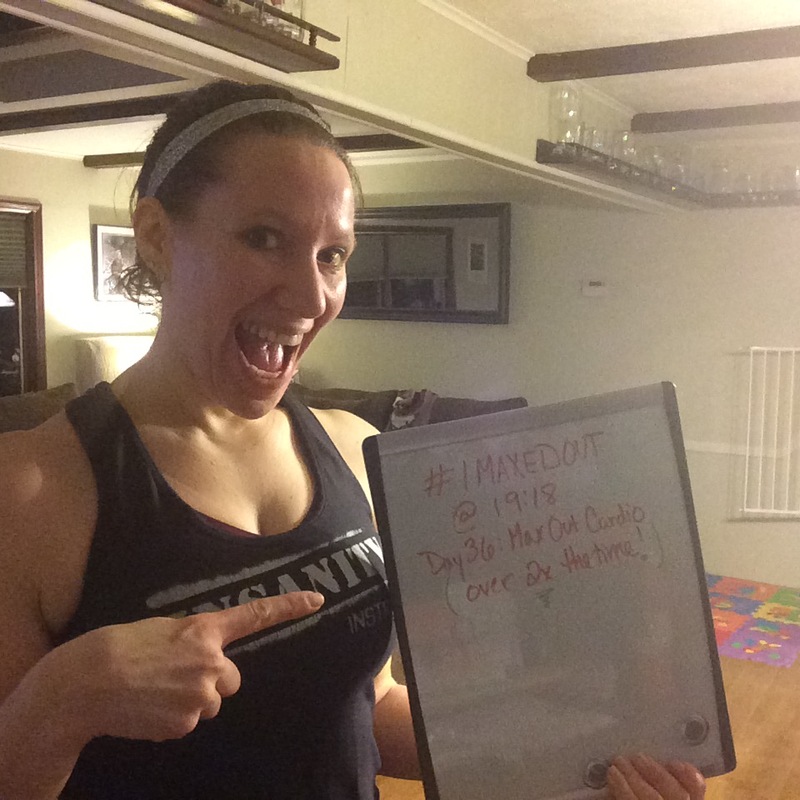 This was that last fit test workout and…I didn’t max out! 30 minutes through, having been between 17:00 and 17:21 for the 4 weeks in month 1. This was an absolutely amazing journey of a program. I can’t believe how fast the 8 weeks went and how much I ended up loving it. 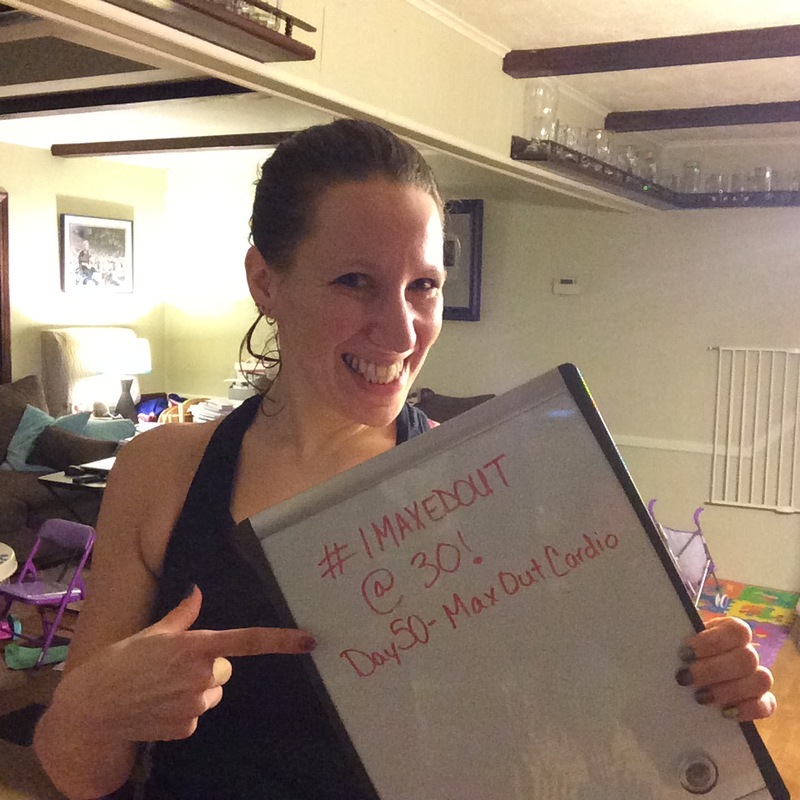 This wont be my last time through Insanity Max 30! 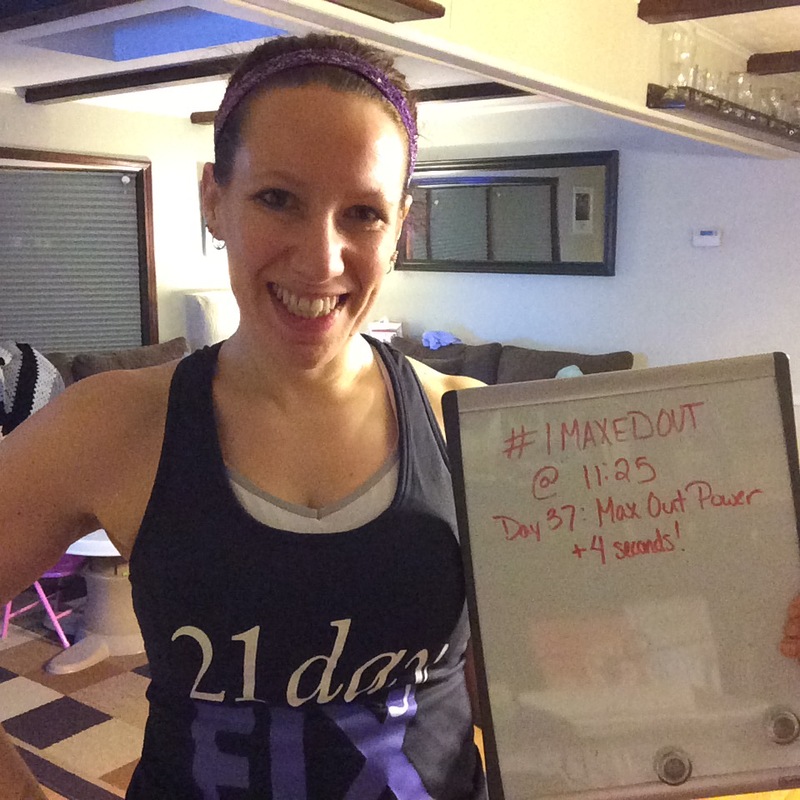 Next up for me is 21 Day Fix Extreme! Mine should be here on Monday, but I have given people until today to order and get in my group starting 2/16…so if you want in, use that link and get on it! So, what are your questions? I want to hear them!! 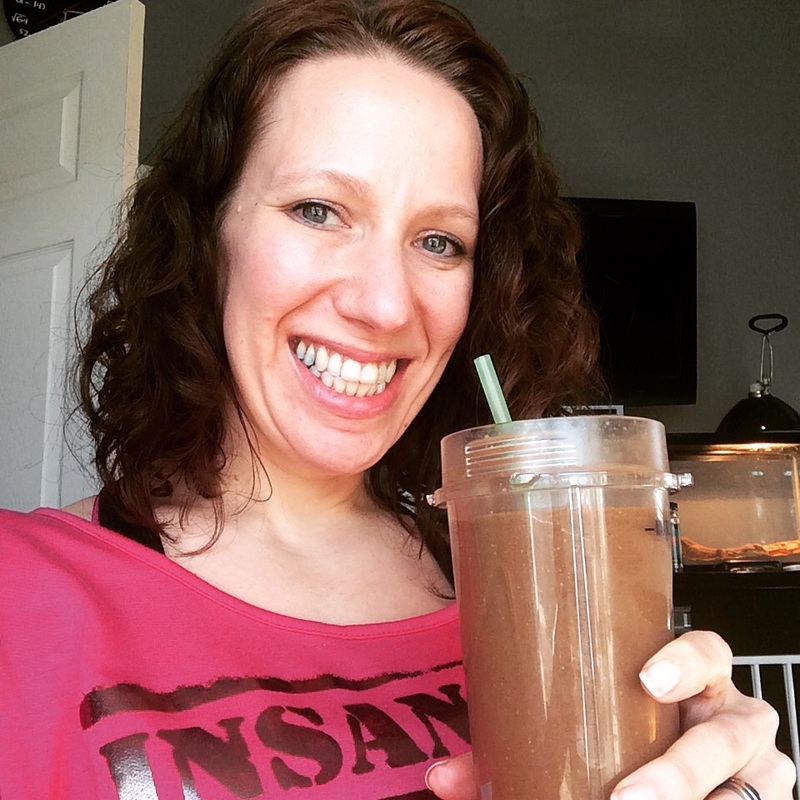 – My nutrition was nowhere near where I intended it to be! It hasn’t been bad by any means, just mostly unplanned bites here and there. I think that the reason has been a combination of good food being around, some other (expected and non-scary) stress and the fact that I know I’m going all out with 21 Day Fix Extreme shortly. – I started modifying moves where I’m jumping on one leg. Now, is modifying maxing out? I say not if planned. If I start a move unmodified or knowing I shouldn’t NEED to modify and then change, I call that maxing out for me. But if I was a less experienced exerciser (or less experienced in Insanity/Shaun T workouts in general), I may go in with planning to modify a lot. So I wouldn’t consider that maxing out…if this makes no sense, let me know! 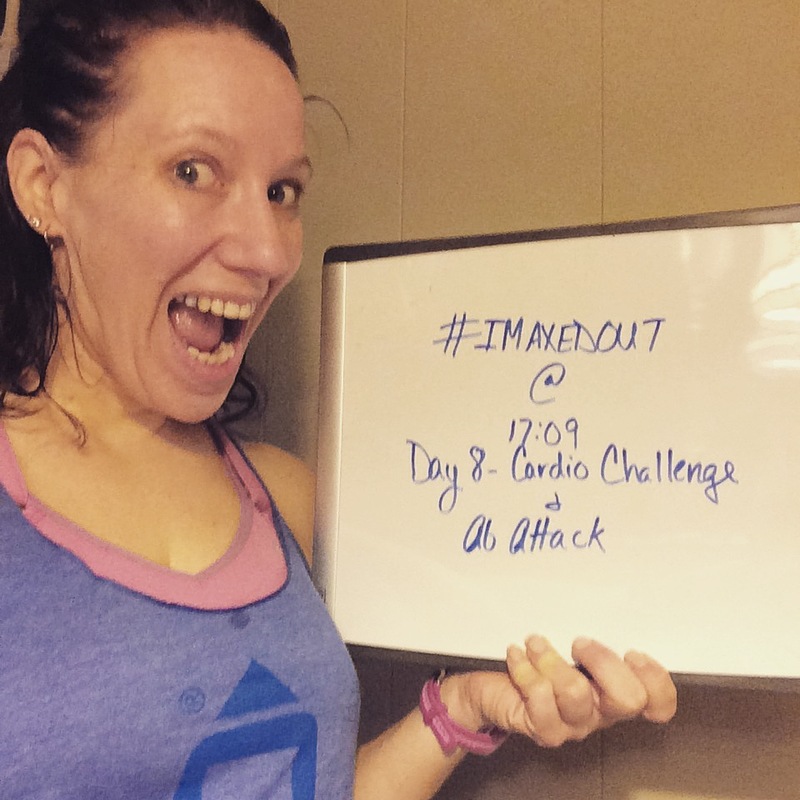 As of week 7, I did not make it through any of the workouts without maxing out (spoiler alert…that changes in week 8!). These are challenging, and you’re meant to max out…there’s no shame in it! Just watch the people in the video! They are all 30 minutes though, which makes it more mentally manageable to tackle than longer workouts. I think that’s my favorite part of this program! So, here are my pictures. 2 weeks of maxing out! Stay tuned for week 8! I have 3 workouts left, including the final fit test scheduled for Saturday, where I go back to one of the month 1 workouts (Cardio Challenge) and see a difference from day 1! Are you excited?? I am! 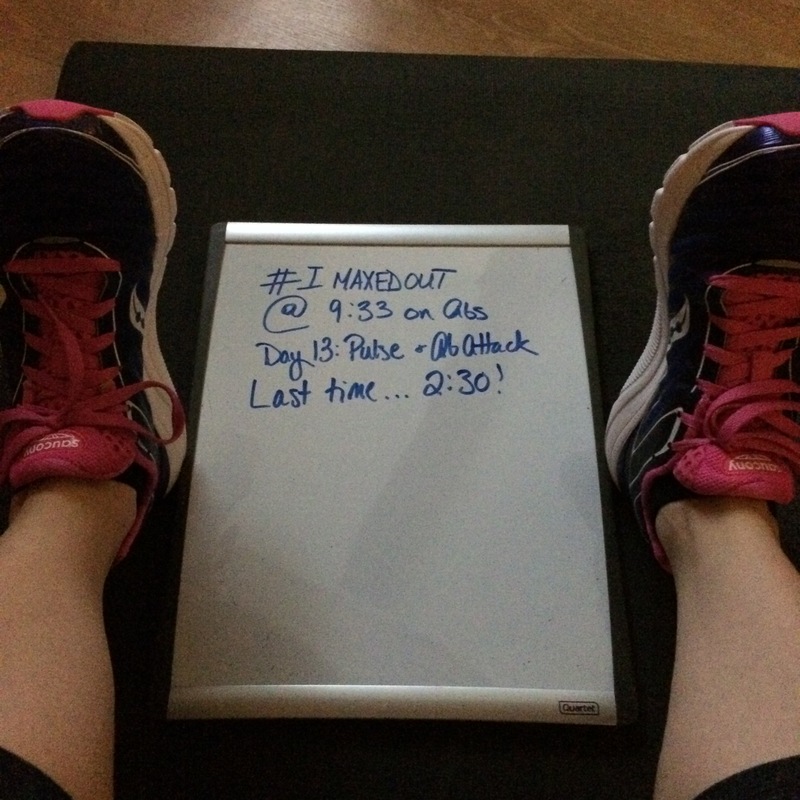 I’ve been having ankle pain with Insanity Max 30 and kind of denying it (hi, maybe it wasn’t just wonky!). For those that don’t know, I have a bone tumor just above my right ankle that really doesn’t bother me unless I run. I didn’t want it to be an issue. 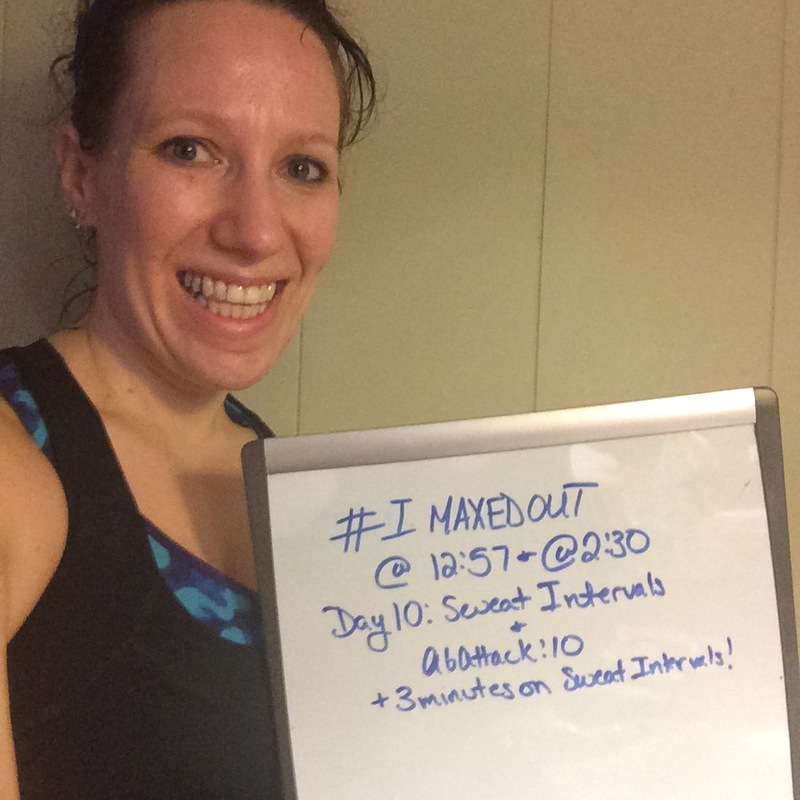 I enjoy the workouts, want to push myself and felt like I was failing myself (because I should be able to do this!) and the program (because it’s amazing!) by admitting it. Until this morning. What changed? I remembered that I’m basically working out on concrete, with a jump mat over it. Not the best surface. That made me think…what would I tell my challengers if they had this issue? Probably that for you, modifying moves where you’re jumping on one leg (which is what is bothering me – if you look at when I max out, it’s either triceps push ups or jumping on one leg) isn’t maxing out. So I’m going to try that for the remainder. I wish I did it today, because I’m in some pain now. I’ve iced it a bit and I’m hoping it feels better after some sleep (I’m sure that having a snowy evening dance party didn’t help, but…snowy evening dance party!). And our next home will have a more suitable surface for exercise! What would YOU tell someone with this situation? 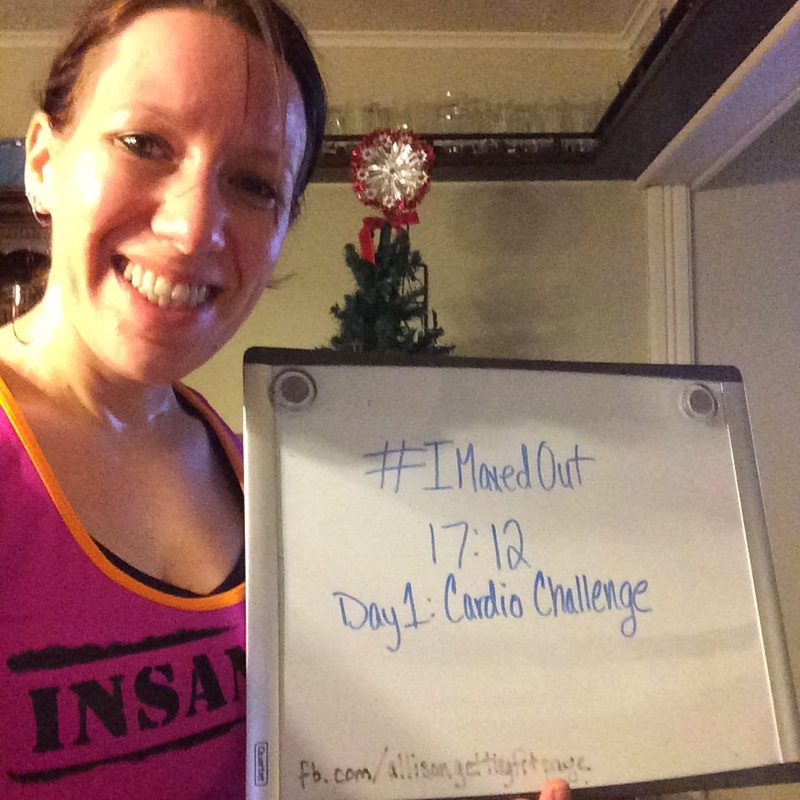 Day 22 – I made it a few more seconds in Cardio Challenge. So, continued improvement, but not massive. I was happy with every second longer I went! 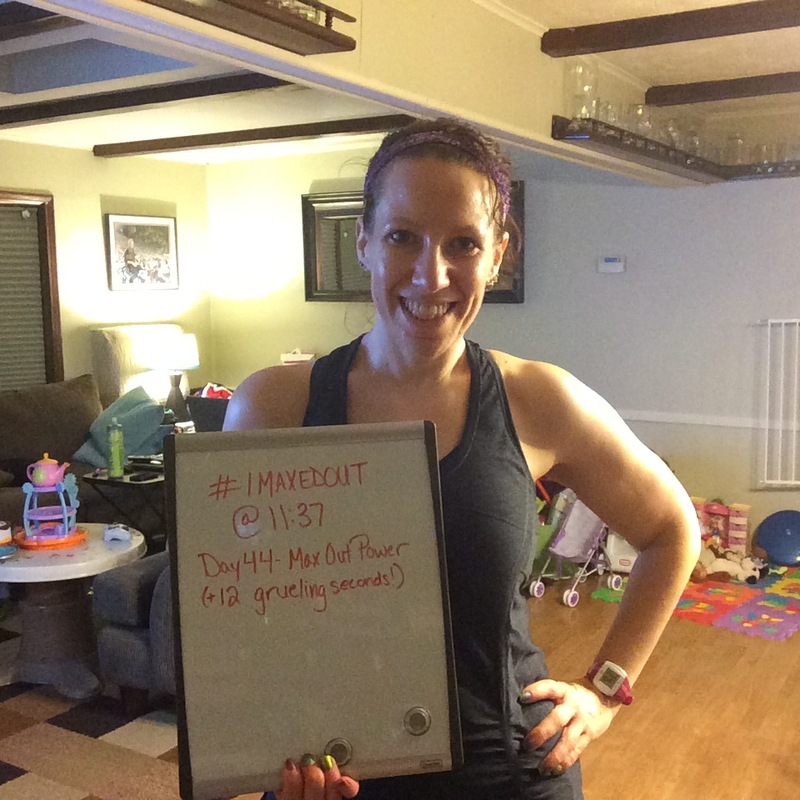 Day 24 – Over a minute and a half more on Sweat Intervals! This definitely lived up to the title. You can tell, right? 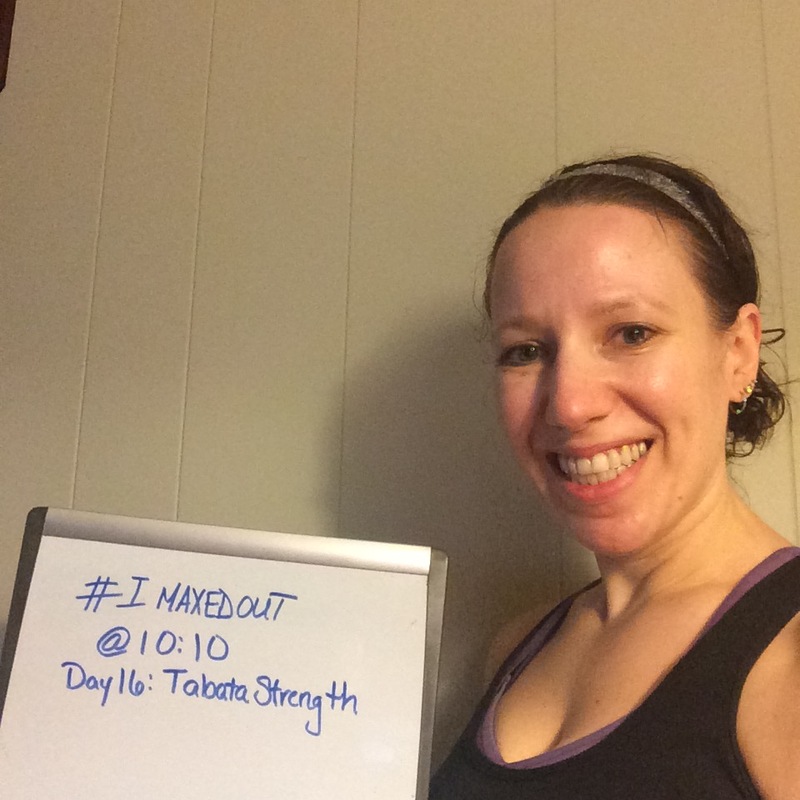 Day 25 – Last time through Tabata Strength (for this round, at least!) and loved it! 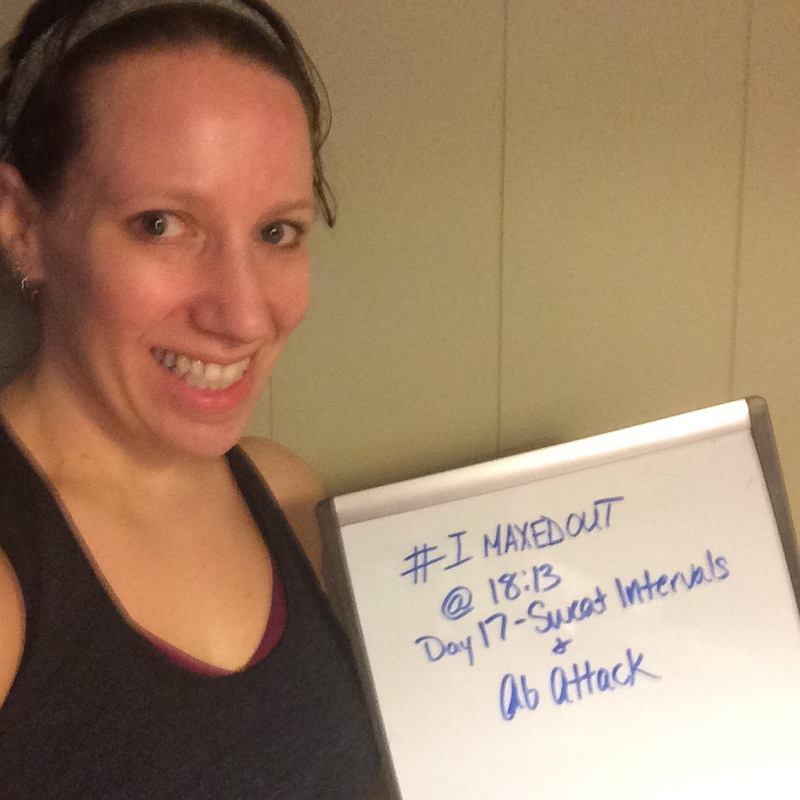 Day 26 – Last workout in Month 1! – Friday Fight Round 1. An extra 6 seconds here…my time didn’t change much on this one, but what I did notice was that I took less breaks overall after I maxed out. You just see the first times here. It can be difficult to push yourself once the max out time is out of the way! Then it is easy to take breaks! Now we hit month 2! This week was really rough for me…I had some not-real injuries, basically my body just being its wonky self. My ankle and wrist were bothering me, but I knew nothing was really wrong. I did end up using the modifier track one day, though I didn’t modify everything. I’m feeling much better now! I’m glad I stuck it out and did what I could, and hopefully it means awesome improvements in Max Out times! 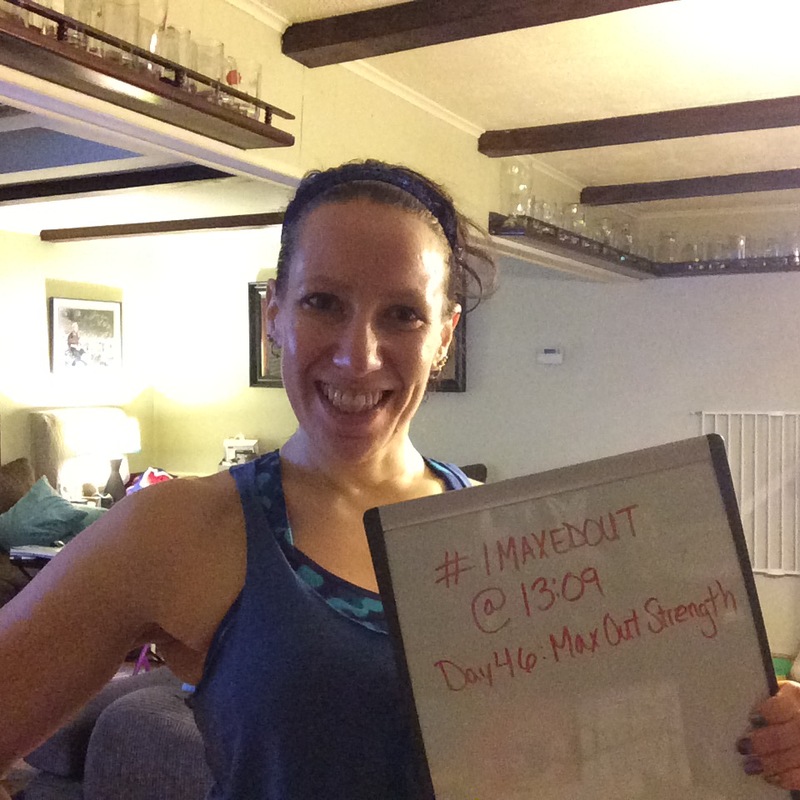 Day 30 – Max Out Power – Instead of 20 seconds on/10 seconds off, we have 45/15! Harsh! Those 15 second breaks are much needed and well deserved. 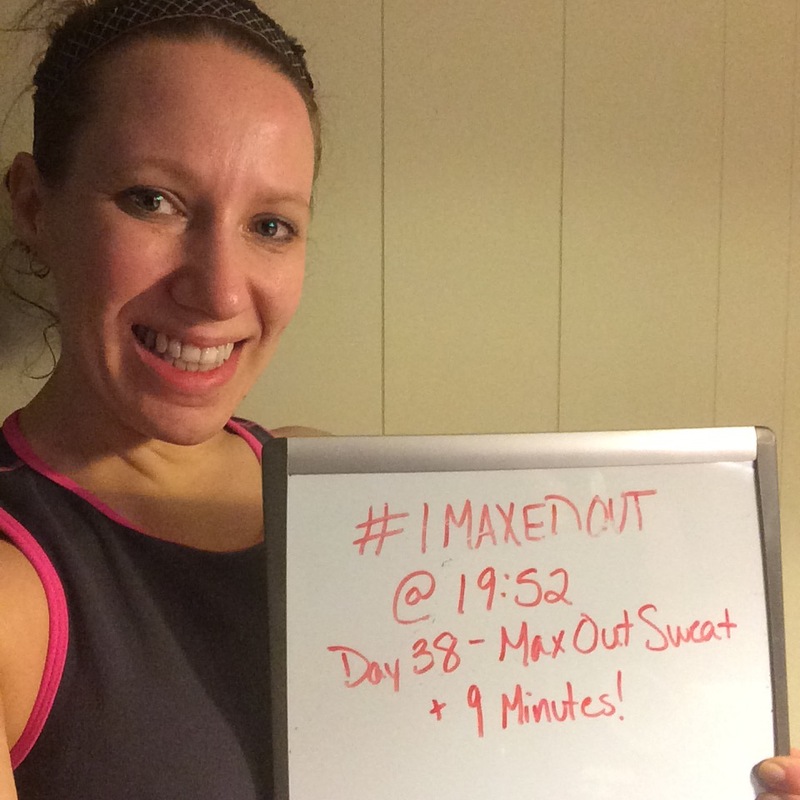 Day 31 – We needed more sweat…oh wait, it’s called Max Out Sweat. More sweatyness. I barely remember this workout (is that a good thing or a bad thing?) so I’ll go into more detail next week! 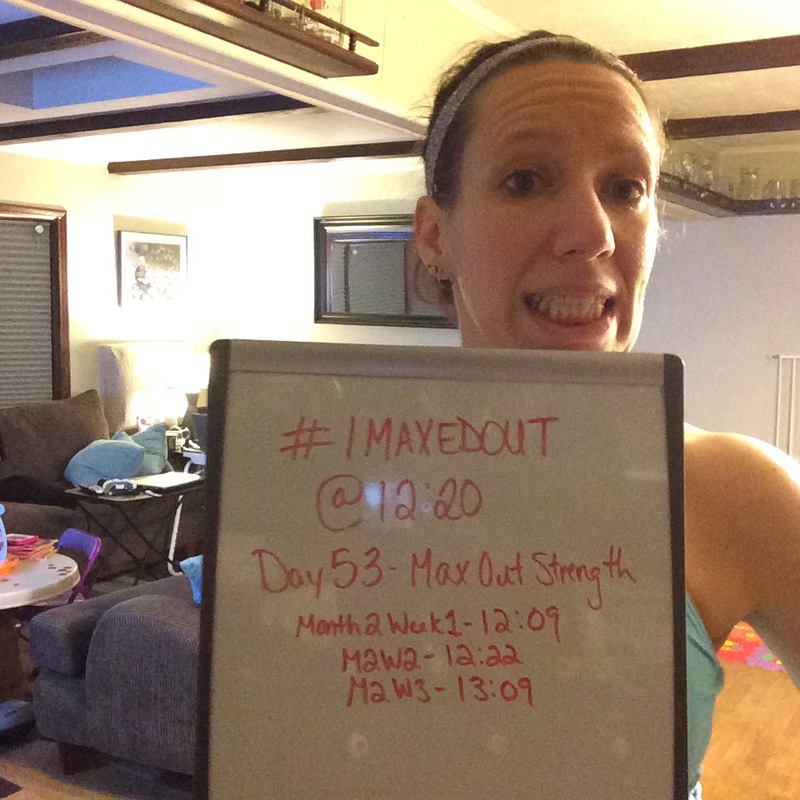 Day 32 – Max Out Srength – Another with the 45/15 split. This one I started doing some modifications on. I still pushed myself and didn’t modify anything before my max out time. It was more fun than I expected, especially considering the “failure” of modifying. Not that it’s a failure…read along! 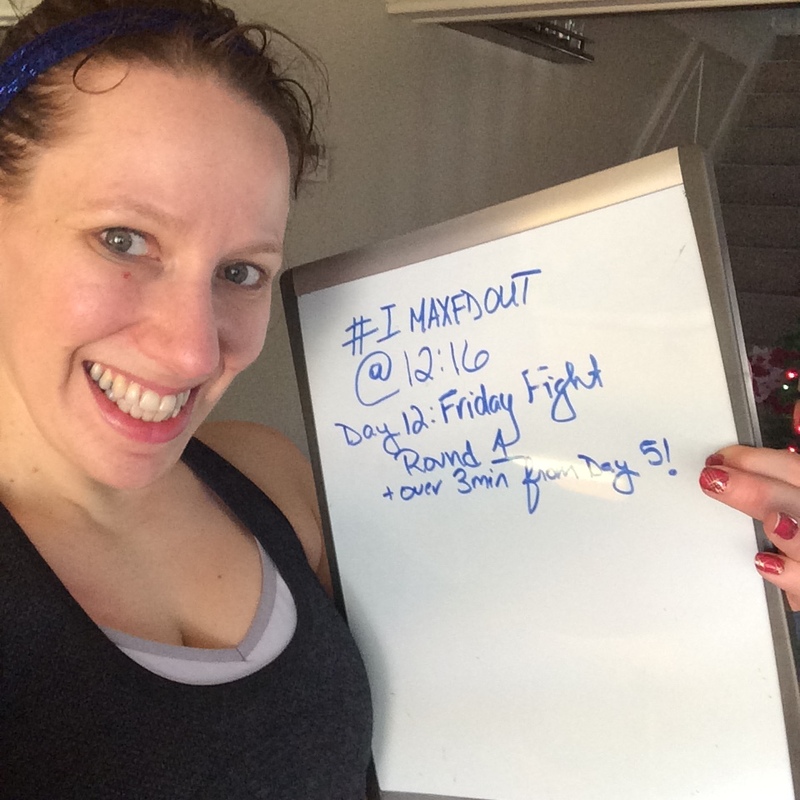 And last, but certainly not least, day 33 – Friday Fight Round 2! I started this one with the modifier track on, which was a good experience. The modifier option shows both the regular video and then just the modifier so you can see them the whole time. Very helpful to not be looking at the screen hoping to catch a glimpse of them! I also only modified after I maxed out, though it was tough! I had banged my knee pretty badly Thursday night and I think limping caused more wonkyness. I’m doing so much better now, but I didn’t want to overdo it and end up actually injured. So, on modifying. It is a stellar option. There is absolutely no fault or shame in modifying. In this program, modifying is really only maxing out if you didn’t plan on modifying a move or started out and needed to change to modifying. So it’s all in my head that it’s failing, and that’s there because I didn’t plan to take modifications (except on some push ups) when I started the program. But modifications are GOOD! They allow you to stay active and not get injured. I know that. I just have to listen to myself! So far, I’m really enjoying the program and it feels super crazy awesome when you improve on your max out times. If you have any questions, comment or email me! I’m happy to share my thoughts! 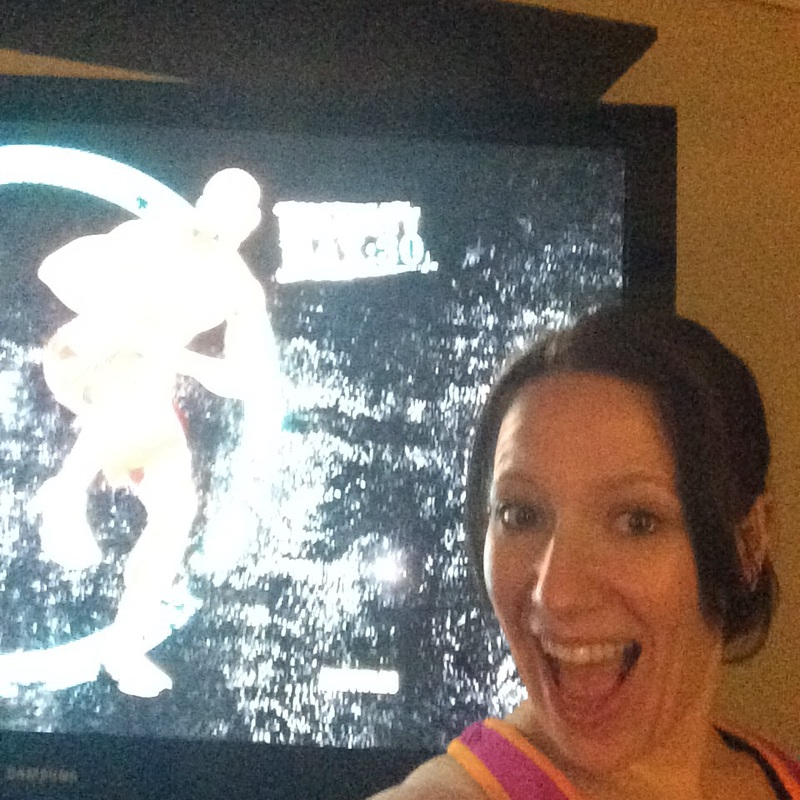 Insanity Max 30 – Weeks 2 and 3! 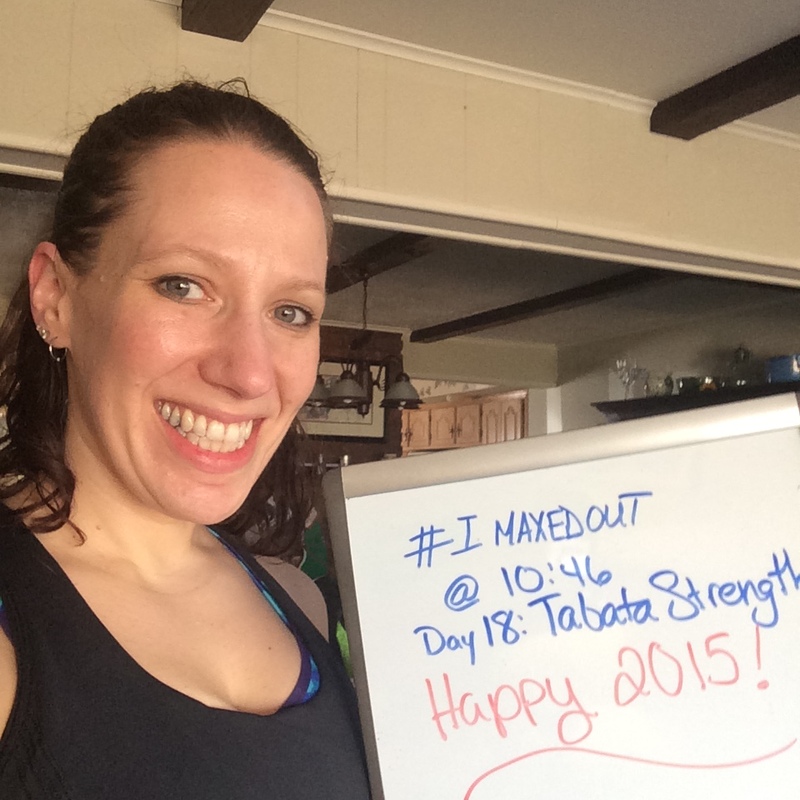 All of the workouts were the same, other than Tabata Strength. This replaces Tabata Power in weeks 3 and 4. The big difference is that after doing 8 tabata rounds of 20 seconds on/10 seconds off, you do an active recovery move instead of a 30 second water break. Oddly, I did better on this workout! I was able to power through the diamond (triceps) push ups and get pretty far this past week! Let’s get to those max out times, right? 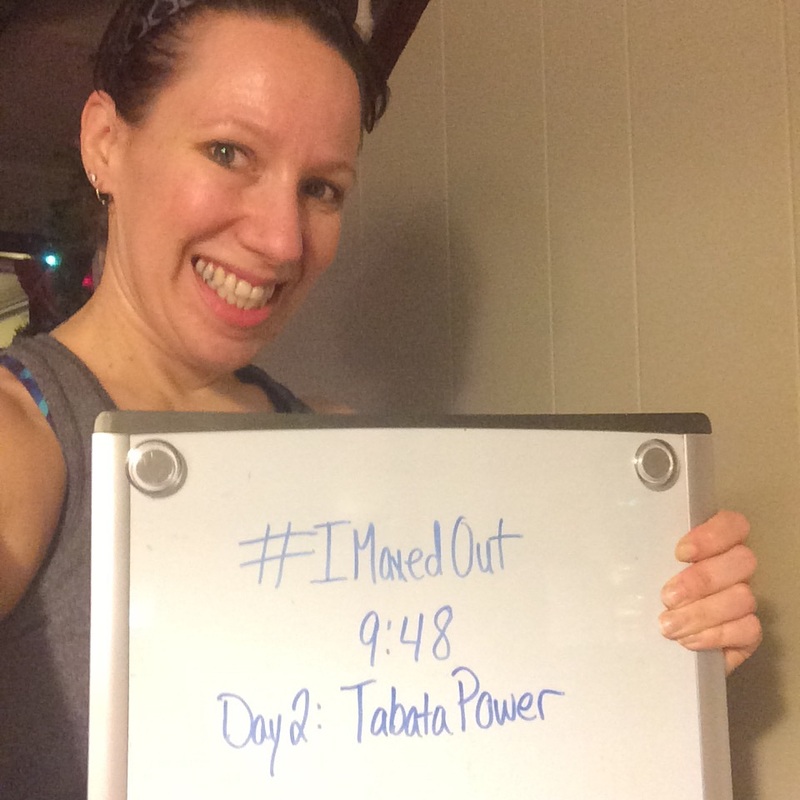 So, I did worse on the last time through Tabata Power than the time prior…it was always the triceps push ups that did me in! 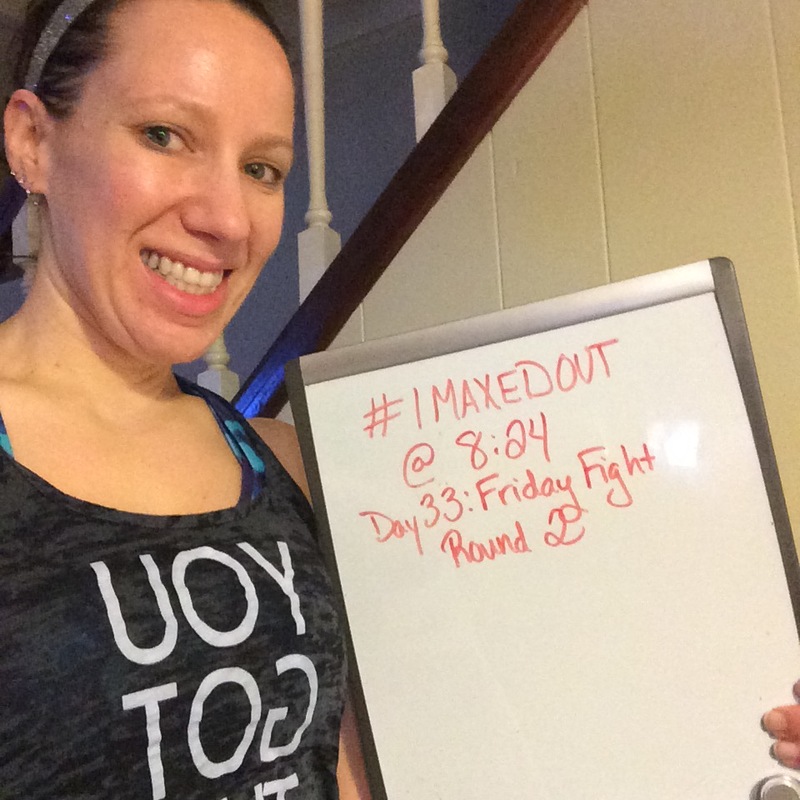 I increased my Friday Fight – Round 1 time by over 3 minutes. 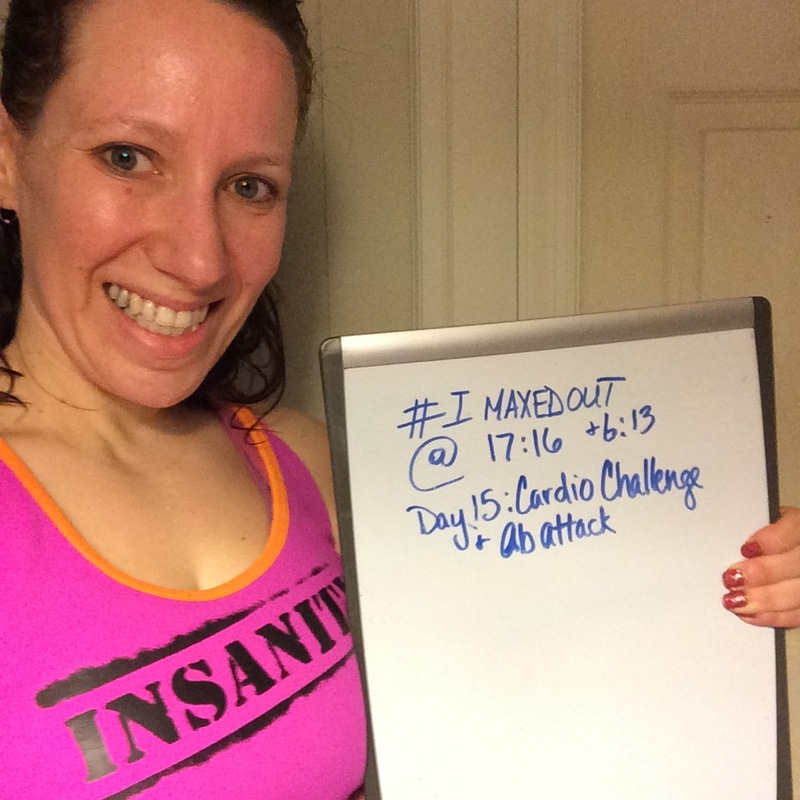 I also noticed that the Ab Attack times were hugely dependent on the workout I did before it. On the day with Pulse (the recovery workout), I almost made it to the end without maxing out. But with a more intense workout, my times varied from 2-7 minutes. 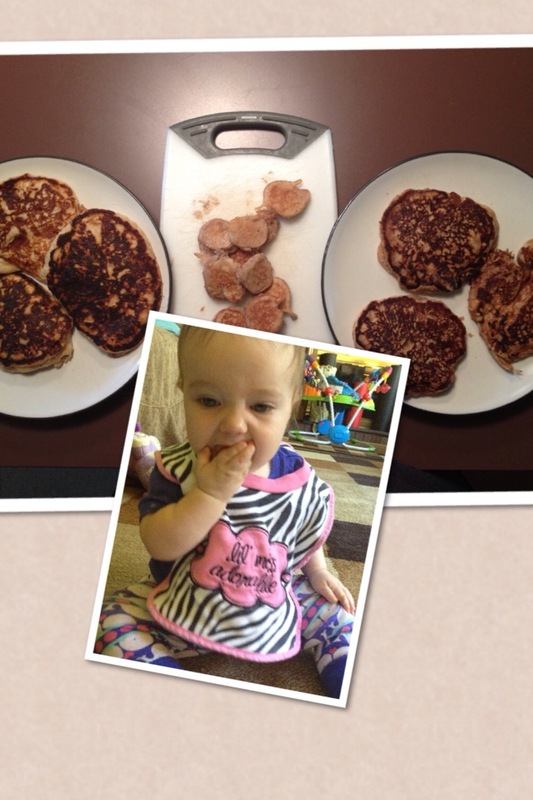 So I stopped tracking it in week 3! 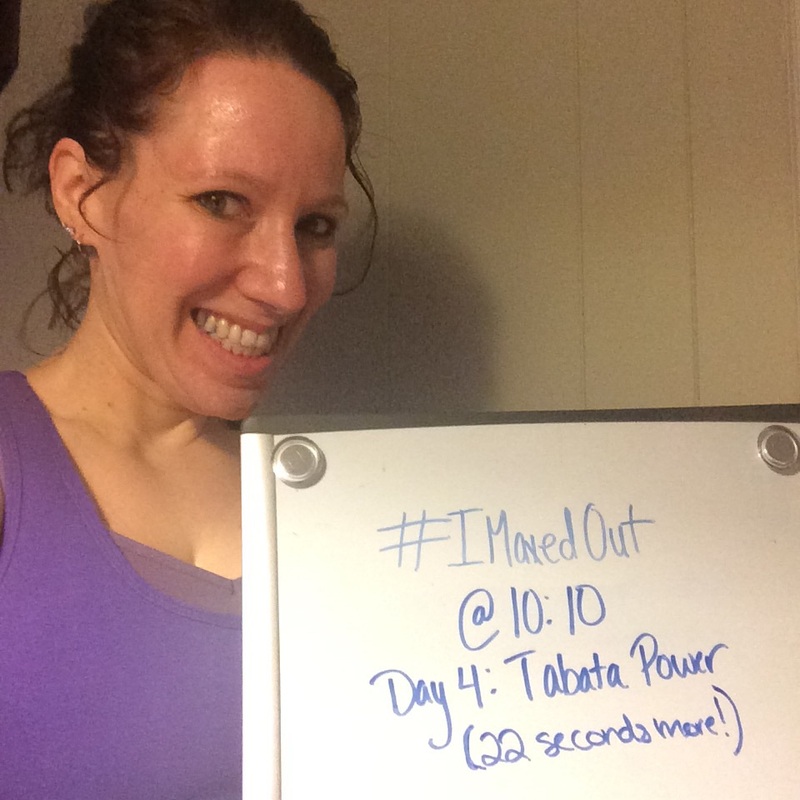 I made it a lot further in Sweat Intervals and got to try Tabata Strength! I feel like I max out every 20 seconds in that one and am thankful for the quick breaks! My big improvements on that one came this week! I’m really liking seeing my times improve (when they do!). It’s such immediate feedback to go by! I feel amazing too. 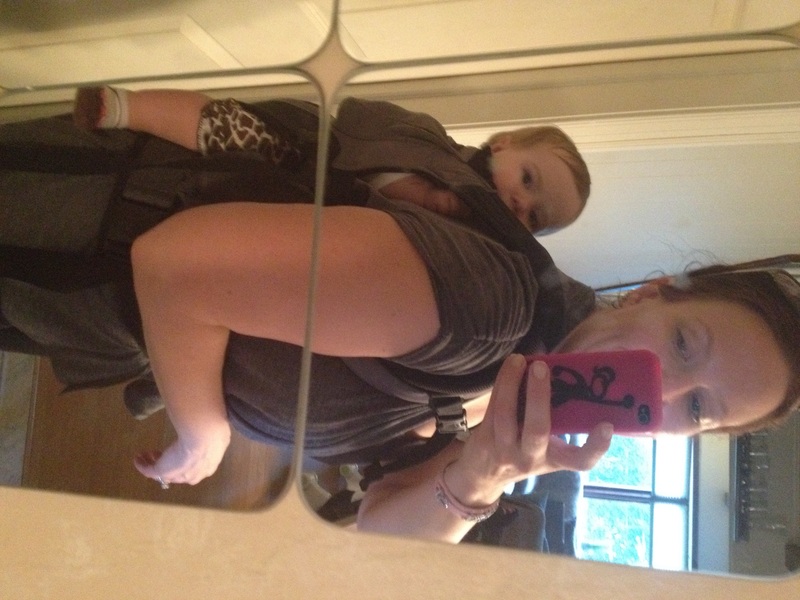 I wore a dress yesterday that I never expected to wear after having my daughter…it’s not a forgiving cut. It was loose, and I felt confident in it. That is an excellent feeling, folks! How are you measuring your success these days? Stay tuned for week 4, and a bit about my nutrition so far on the program! 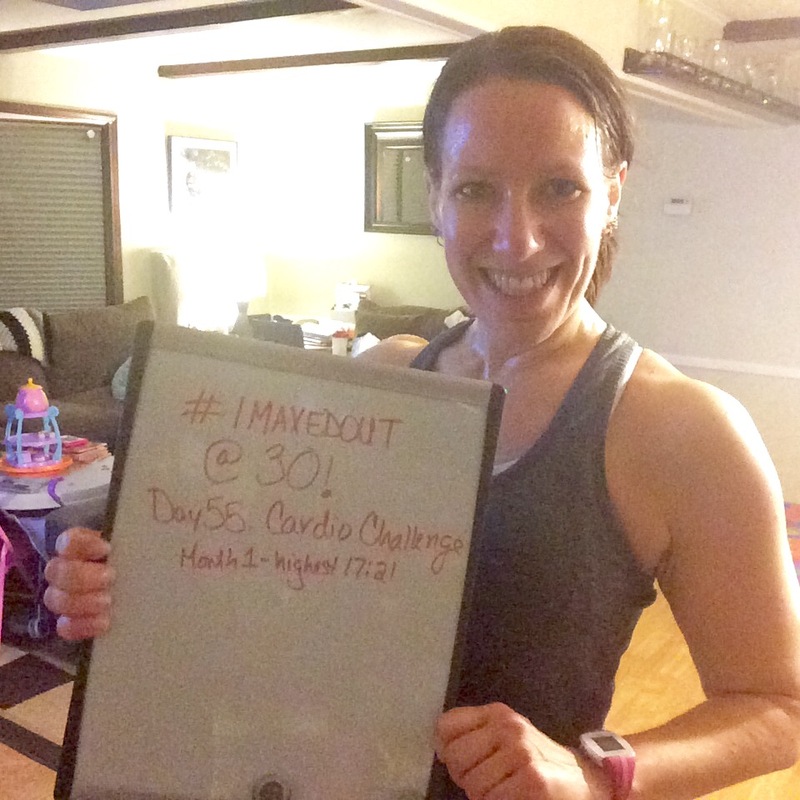 Insanity Max 30 Week 1! 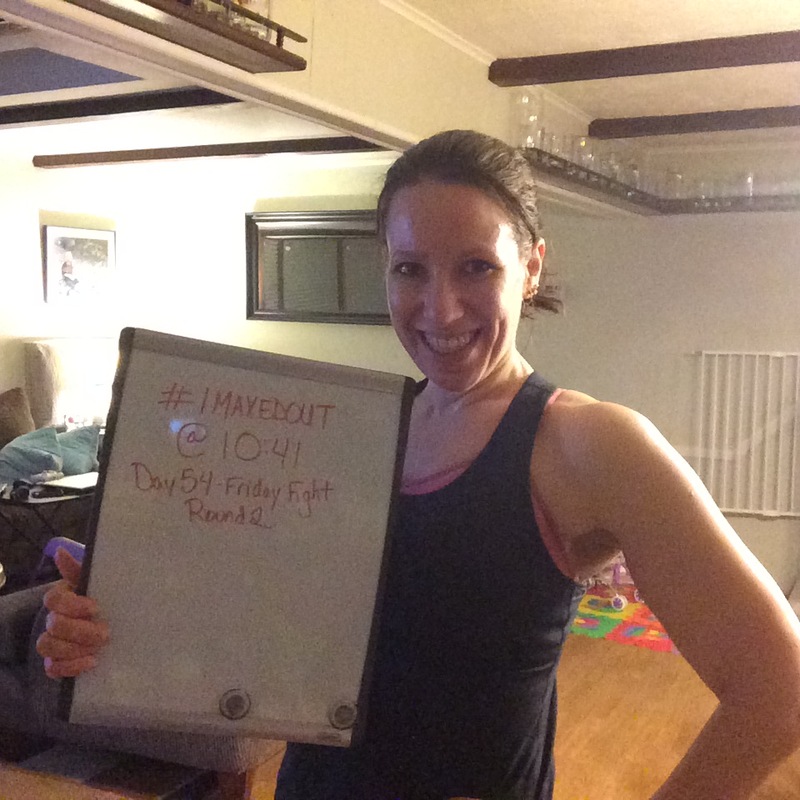 Today is day 9 of my Insanity Max 30 journey. I wanted to update on how my first week went and tell you a bit more about the program so far. So, maxing out…what is it? It is that first moment where you NEED to stop. The point is to push yourself to fail and not be able to keep up with the program (either the modified or full version) , record the first time you can’t, and keep going. Then as you move along the 60 day program, you should see the times getting later as you get stronger and fitter. I’m taking pictures for each of my max out times, so here we go on my week. The program is 30 minutes (plus a 2 minute cool down) 5 days a week, plus Pulse on day 6 – 20 minutes of lighter cardio and stretching. I opted for the Ab Maximizer schedule, which adds about 10 minutes of abs on some days starting in week 2. 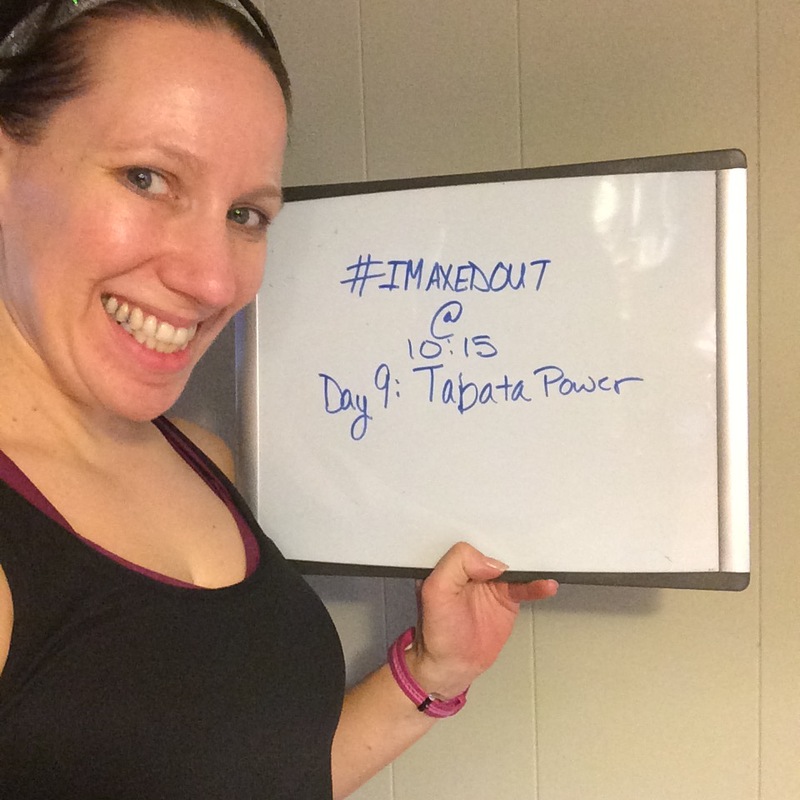 Day 2 – Tabata Power – If you haven’t heard of Tabata workouts yet, it’s basically 20 seconds on 10 second rests. This sticks to that, over and over, and also has some water breaks. It is tough! This is basically a strength program, but no equipment. Think push ups and dips! They are basically in segments and I haven’t mad it through the push ups without maxing out yet! 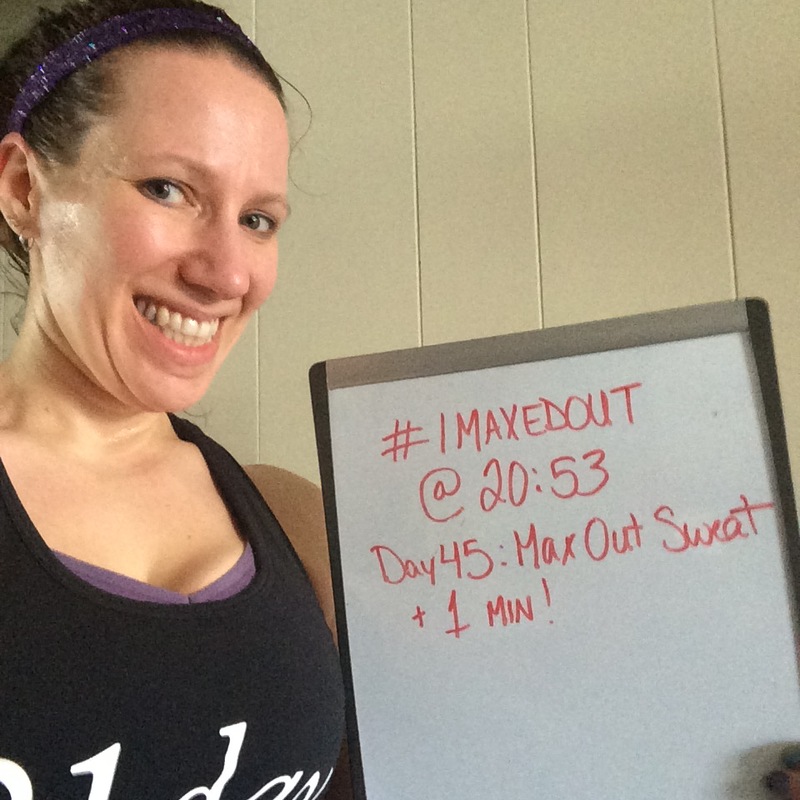 Day 3 – Sweat Intervals – More cardio! This one is similar to Cardio Challenge. And as you can see, it lives up to its name! 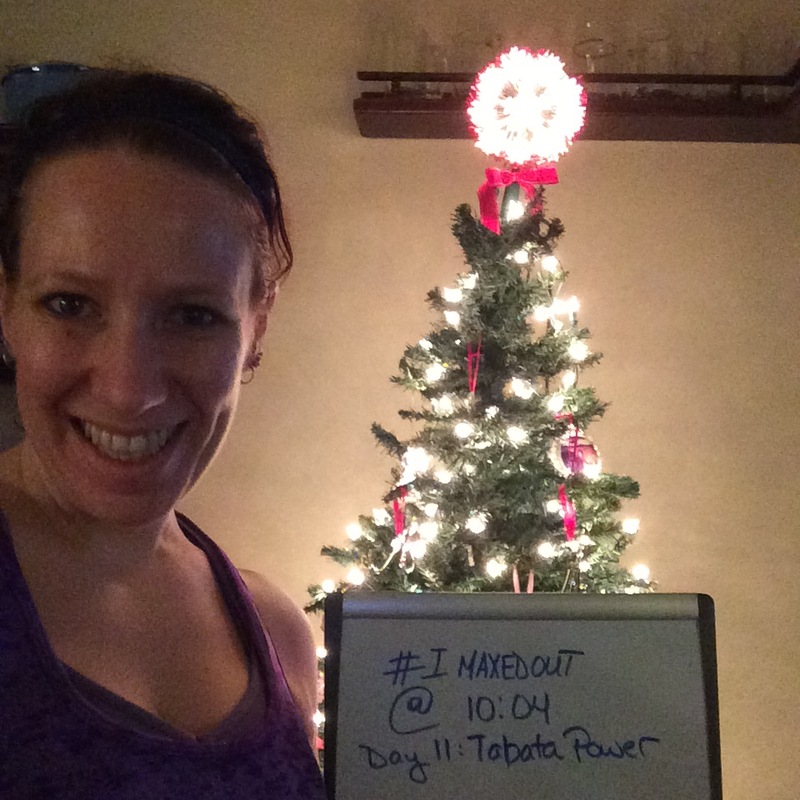 Day 4 was Tabata Power again. I lasted 22 more seconds this time! This is what’s on my schedule today as well. We’ll see how I do with working out a little later in the day (these were all started about 4:30 am). 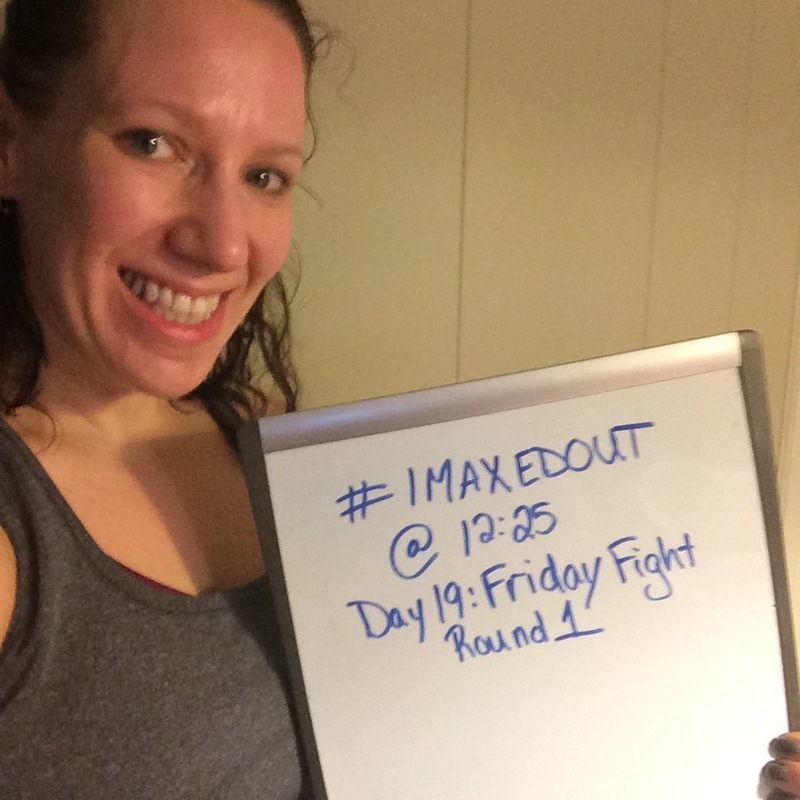 Day 5 – Friday Fight Round 1- As in fight to not max out! It is said that this one is a mental and physical battle and I maxed out mentally…unsettled sleeping baby, mat moved around, hair in my eyes…I wasn’t focused. I will do better this week! In keeping with holiday accountability, I tried to avoid gingerbread house making becoming gingerbread house eating with a well-timed shake Friday afternoon. No need to unleash the candy monster too early! It worked well. Saturday was the Pulse workout, which is a nice recovery workout. Small movements and low impact cardio…easy on the brain and body. I also did a little PiYo after because I wanted to finish out learning a section. I then did hot yoga on Sunday, probably not my best idea for Monday though it felt amazing on Sunday! I plan to do more resting on this Sunday. Some things that surprised me in week 1…my legs. So sore. My goodness. Coming off of workouts like Body Beast, you would think that a no-equipment workout couldn’t get me but you’d be wrong! The jumping and squatting did a number on me. I didn’t notice it until Friday Fight, but since then I’ve been enjoying the soreness. Nothing too bad, but noticeable! Also the length is perfect. I wasn’t sure if 30 minutes would feel like forever with pushing to max out, but it’s a good length. I don’t know if this one’s surprising, but I definitely feel like I’m burning extra calories well after the workout ends, which is awesome! 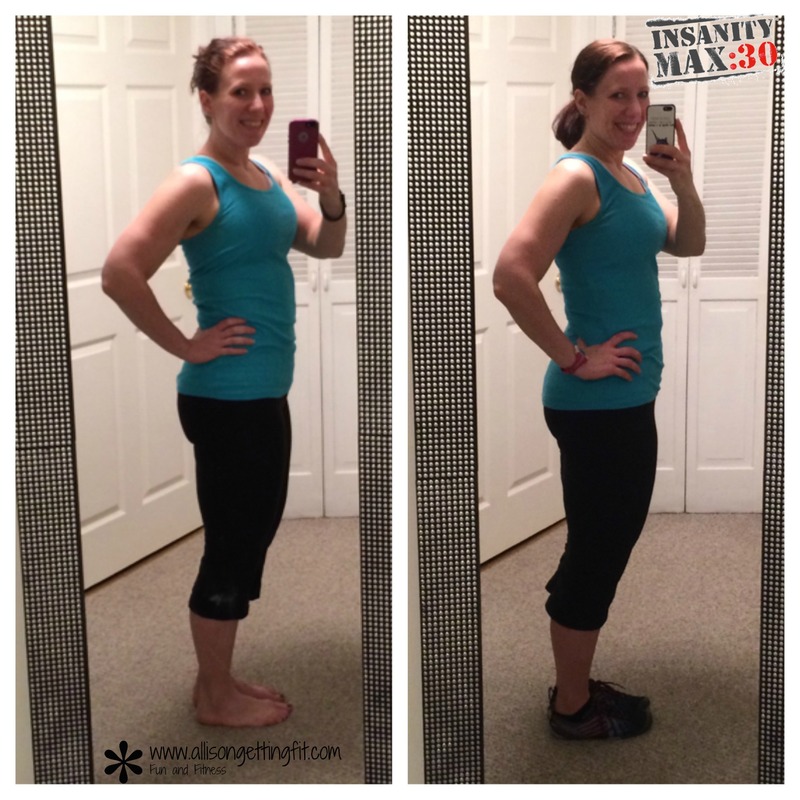 A little about the nutrition plan that comes with Insanity Max 30 – it’s basically the 21 Day Fix plan (now also available as just the nutrition part to pair with any workouts as Portion Fix) with the option of using containers. The containers come with the deluxe pack. It splits you into 2 calorie brackets – if you’re over 150 lbs or under 150 lbs. 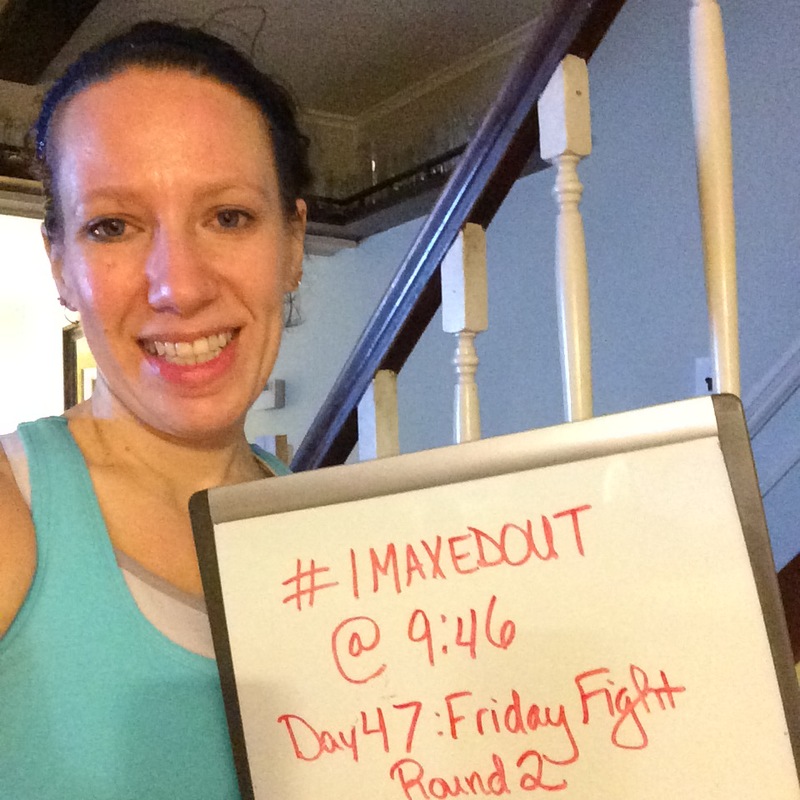 I end up in the 21 Day Fix bracket that is one above where I am if I figure it out through the 21 Day Fix formula. Which makes sense as these workouts are mote intense. 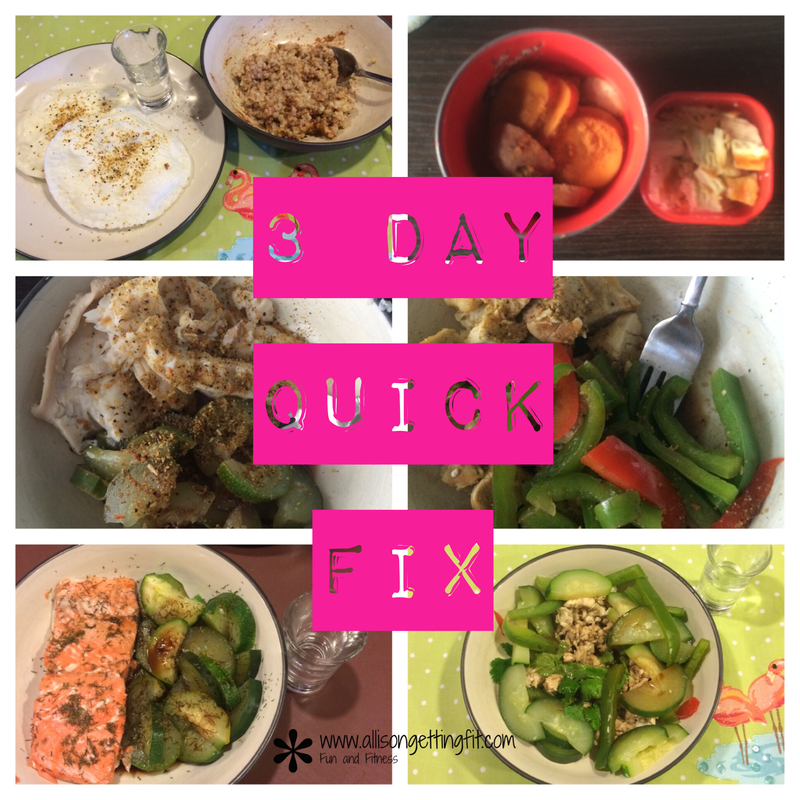 So on my sidebar where it says how I’m eating, I left the 21 Day Fix though I could say either program…they’re the same! 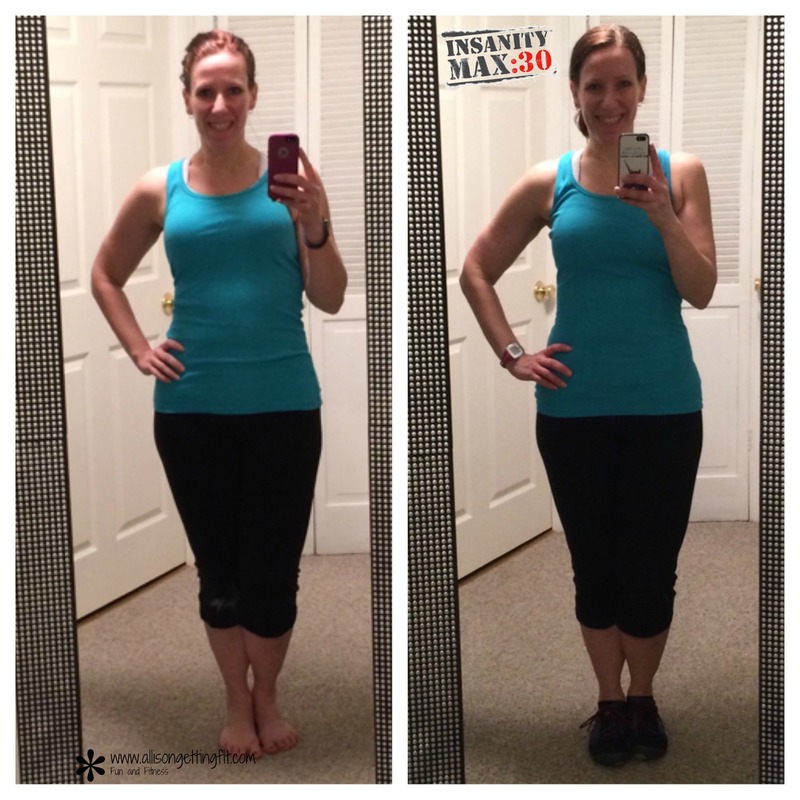 I love the 21 Day Fix, so that works for me. 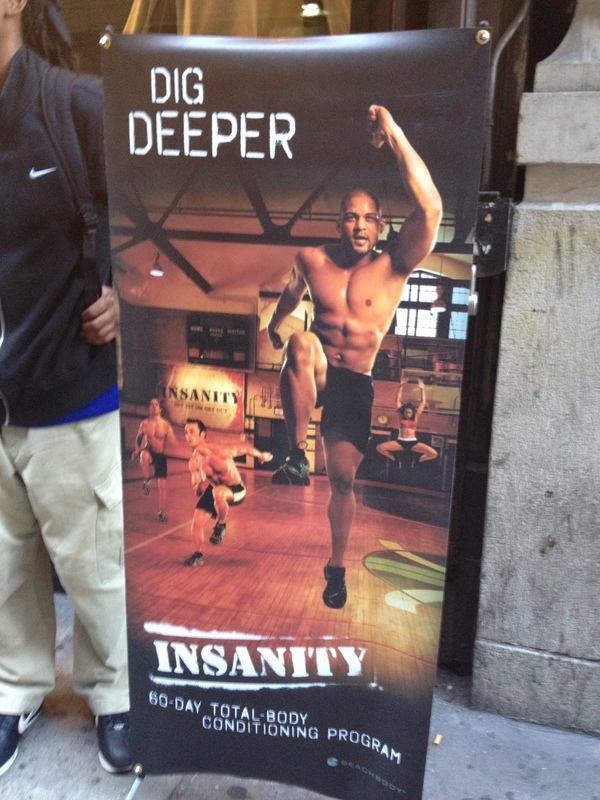 What questions do you have about Insanity Max 30? Let me know and I’ll answer what I can. The bundle of Shakeology, the base program and support from me is on sale until the end of the month, so ask now and get in on a deal. I love/live to save! 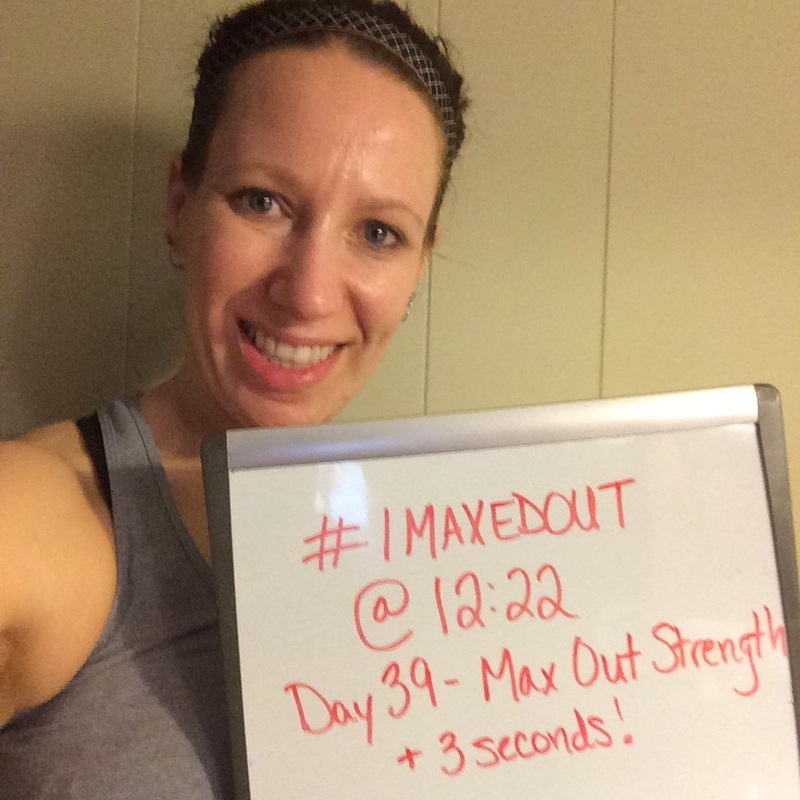 Watch the video for some quick product news on 21 Day Fix, P90, Shaun T’s new Insanity Max 30 and 21 Day Fix Extreme (link will work starting 10/8/2014)!